Mason jars truly are a crafter’s best friend. If you are simply using them to store food or other items, you’re missing out on great DIY opportunities. And no, you don’t need power tools or heavy machinery to alter these glass jars. 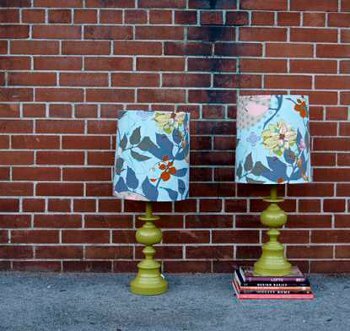 In fact, you can use fabric, paper, paint and so much more to create a pretty decor item for your home. But wait, there’s more! Did you know that you can also decorate a mason jar from the inside out? Turn a simple glass receptacle into an aquarium or a snow globe with only a few easy-to-find supplies. 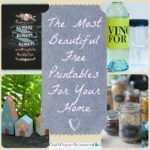 Mason jar projects are perfect for frugal living enthusiasts and eco-friendly crafts. We can all cut a few corners, especially when it comes to the cost of craft supplies, so why not save big and reuse your glass jars? 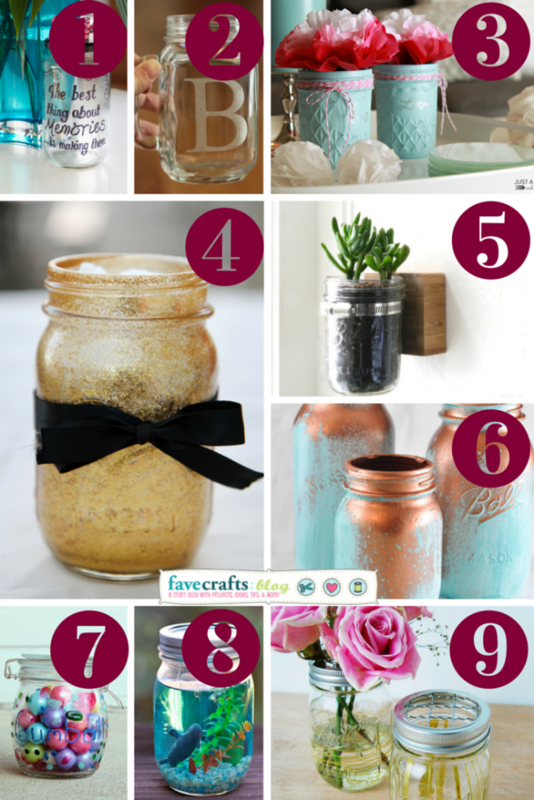 We here at FaveCrafts love mason jars just as much as the next crafter. That’s not true – we’re actually obsessed with mason jars and love finding new, inventive ways to use them in craft projects. One reader-favorite DIY idea is Mason Jar Vases, which only requires four supplies. These look great as a centerpiece on a picnic table or in a dining room – you can even add more feminine touches and use them as wedding decorations. Girly Pink Collaged Mason Jars make great candleholders or catchalls for jewelry. Since spring cleaning season is just around the corner, it’s important to remember that you can use mason jars for organizing your craft or office supplies. Our roundup of 5 Mason Jar Ideas to Keep You Organized will help you take control of your space and clear your clutter once and for all. It’s time to join in on the trend that’s taking over the craft community. Save up those mason jars or buy them in bulk at your local home goods store – they serve so many important purposes and can be customized to fit anyone’s home decor. As long as you have Pinterest and FaveCrafts at your disposal, you’ll never run out of crafty ideas for mason jars – we promise! Remember, if you enjoyed these organizational mason jar crafts, then you’re going to love what’s in store for you inside our free eBook, 20 Crafts with Mason Jars: Wedding Ideas, Centerpieces, Decor, and More! Download your own free copy today! This post is brought to you by Edward Stuart. To say I love books and art is an understatement. What would be a better word? Obsessive? Enchanted? In either case, if I could sit in a library all day, it would be wonderful. I love being around books. End of story. Now, for you book and art lovers like me, I really wanted to incorporate old and vintage books into some type of art project. There is a great bookstore located in Boise, Idaho that I always travel to (Hyde Park Bookstore) that is filled with vintage books, and that old book smell (come on, you know you love that!). As I was slowly passing by each bookshelf, I found myself wanting to integrate all of these books into art projects—and hey, some books need attention after being set on a shelf for so long! Now, don’t get scared. I know that some people really, really hate destroying books. I get it! I do too— we all know those people that completely rip out pages and turn them into origami (eeeeek!). We want to die inside when we see this–but this is for the greater good of art, and technically, you aren’t destroying a book if you’re reusing it, right? Maybe “destroy” isn’t the best word… construct, produce, redesign. You can do this easily by purchasing a cork board as your headboard (cheap and still effective). Open up the book to the page you want shown on your headboard (do these for all of the books you are hanging up). You’ll need strong nails for this next part—and don’t worry, the books will still live wonderfully after this step. Next, you set up your headboard exactly how you want it to look with all the books you have open. Set the nails on EACH corner of the book; this way, they won’t flap and fall over, or annoy you. And done! Now you have an awesome, knowledgeable headboard. First, pick out the first couple of pages in the beginning of the book that you don’t want cut out. Open up the book, and outline a box on the first page you want cut. Cut within the lines. Keep cutting the pages until you get to the back cover. Be slow with this process: the cleaner and smoother it is, the better. Bring out the solution of glue and water again, and paint the inside of the cut pages to keep those glued together. Allow 10 minutes of dry time. Place your secret stash in this book! This might seem complicated, but it’s really simple! Using a knife, cut the front and back cover of your book so you just have the spine and all the pages with it. Do these to four books—then connect the spines together by gluing the spins and twirl the pages around. 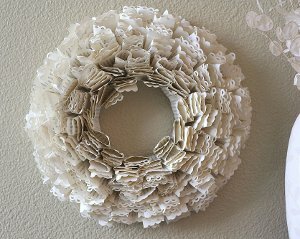 These are just a few ideas that you can use with your old or vintage books. Remember, it’s not destroying if you’re reusing it for artful purposes. Books are more than just reading and gaining knowledge from; they are just as beautiful and important as art itself! Books and art go hand in hand, and these projects help demonstrate that. Have fun with these projects! Guest post by Edward Stuart whose writings are sponsored by the canvas art supplier canvasgalleryart.com. 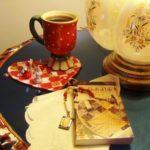 He frequently blogs on the topics of art, art history, design, home remodeling, and his kids. Summer is the season of totes. You can take them to the beach, the market or out on the town – they’re just so versatile. Since there’s so much room in a standard-sized tote, you can store everything from a book to a beach towel. You can even throw your computer in a tote bag and head to your favorite corner cafe – is there a better way to spend a summer afternoon? 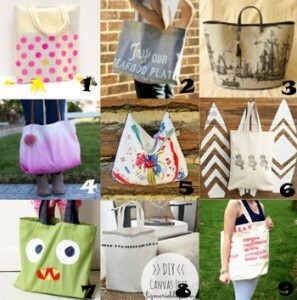 Now is the perfect time to make your own summer tote bag. You can use brand new fabric for your project or upcycle an old t-shirt. 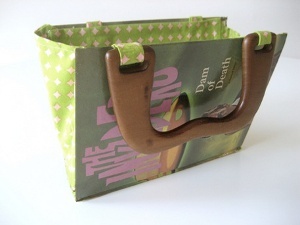 Add fun words, phrases or designs to your bag so it sticks out from a sea of store-bought items. T-shirts are an ideal resource if you want to create bags and save money at the same time. You can maintain the design on a shirt or, if you’re feeling artsy, you can make a Groovy T-Shirt Tote and create your own image using paint. You don’t have to stick with t-shirts to create a fabulous tote, though. Outdated velvet wall hanging work well when creating a sturdy but attractive Repurposed Fabric Tote. Not in the mood to sew? Gather up your yarn and a hook and crochet a Beach Tote Bag using bright, summer colors. 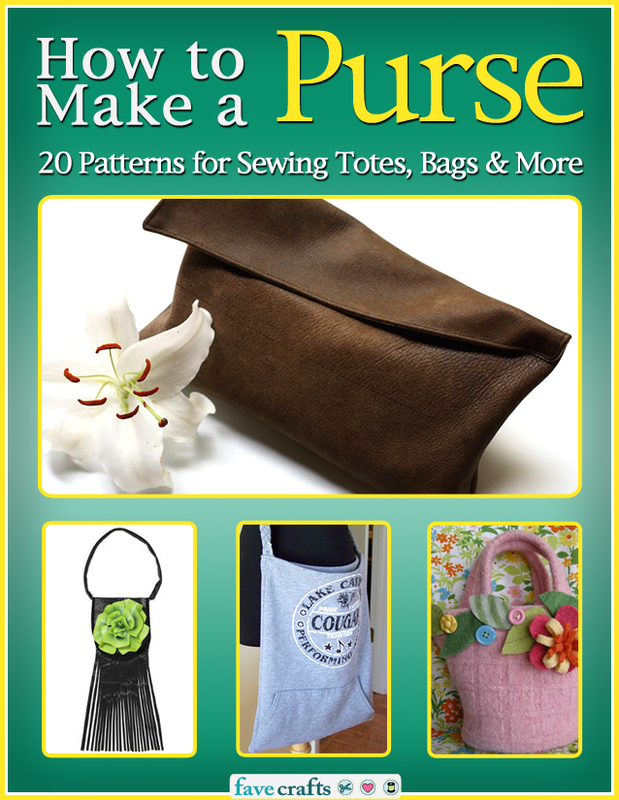 Tote bags are versatile, fun to wear and easy to make – who could ask for more? Start summer with a brand new bag and wear it all season long. When it’s time to head out the door for some summer fun, you can throw all of your belongings into your handmade tote and hit the road! 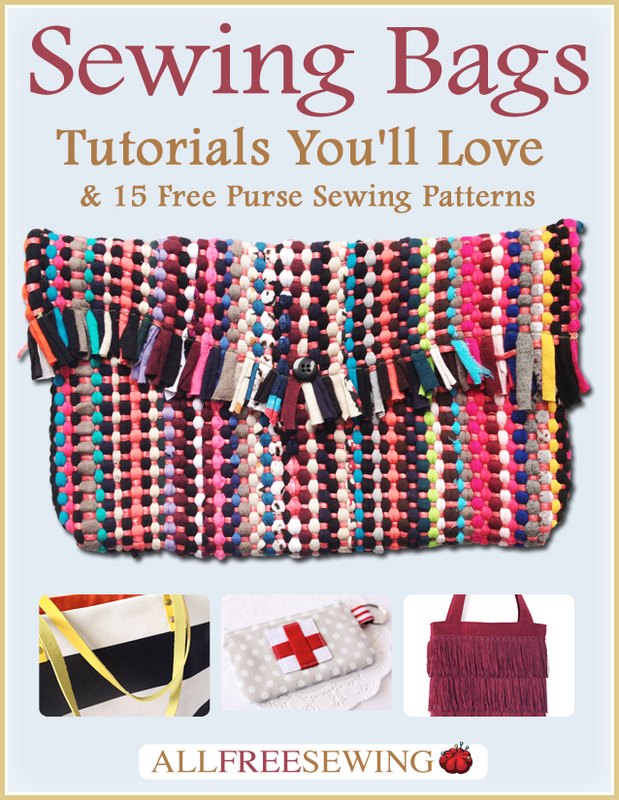 For more free tote bag patterns, download our free eBooks! 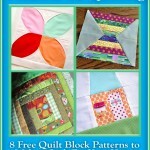 This post is brought to you by Mary Egan from CraftFoxes. 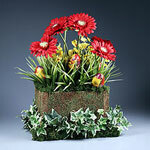 As springtime approaches, crafters are sure to be switching their focus from sweaters and wreaths to flowers. 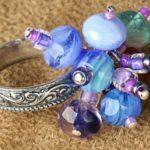 Whether you’re sewing flower-patterned sundresses or looking to upcycle some old items from your winter closet, there are plenty of crafting opportunities in the spring. You may not be able to plant flowers just yet, but at least you can crochet some tulips and daisies in the meantime! We’ve rounded up some spring-inspired crafts to help you get started. In the spring, Easter is a favorite holiday for many people. This adorable pattern for crocheted chicks is simple and perfect for crochet beginners looking to get into the springtime spirit. Though it’s a simple pattern, These little chicks would look on a windowsill even before the flowers begin to sprout outside! 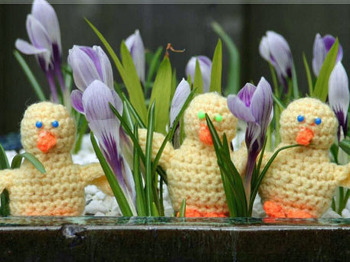 Check out this CraftFoxes for all the details on these crochet Easter chicks. FaveCrafts also featured a variety of crochet crafts for Easter. You can create a large decorative piece like an Easter Egg Wreath or Crochet Bunny Peep and make a huge impression when the day arrives. People often associate warmer air and sunnier days with spring cleaning! When the cold weather is carried away, it’s nice to freshen up your home. 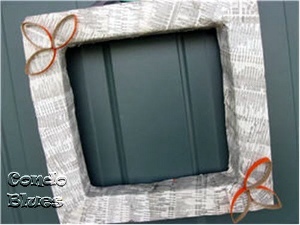 Upcycling is one way to streamline your space without breaking the bank. 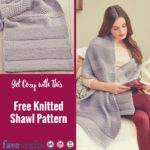 For example, old jeans can become a denim rug, refashioned t-shirts can be stitched together into a quilt, and those winter sweaters can be made into a messenger bag. 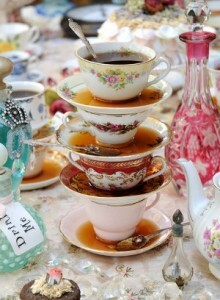 For more details on upcycling old clothes, visit CraftFoxes! Sick of your old sweaters? 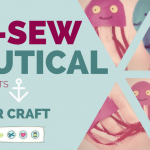 FaveCrafts features a collection of 15 creative crafts to make them new again. St. Patrick’s Day is another fun spring holiday! It’s always fun to wear some festive green clothing, so be sure to check out these great outfit ideas for St. Paddy’s Day. From the adorable head-to-toe in green outfit for kids to a simple, green, clover-shaped brooch to pin on your shirt, there are so many creative opportunities. 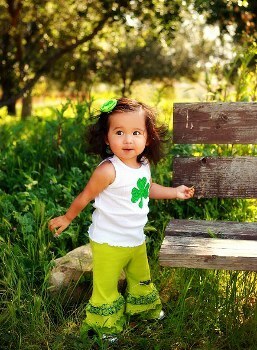 To see all of these great St. Patrick’s Day outfits, visit CraftFoxes! 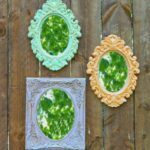 For even more super lucky wearables and crafty ideas, check out FaveCrafts’ collection of 17 St. Patrick’s Day projects. For those of us who live in the colder climates, it can take some time before actual flowers start sprouting. 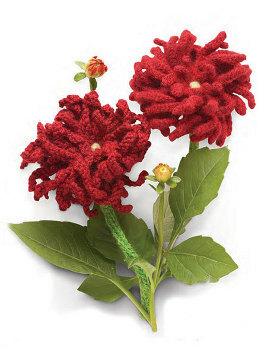 Sometimes you need to make your own flowers, and these knitted dahlias are sure to bring some color to your home. 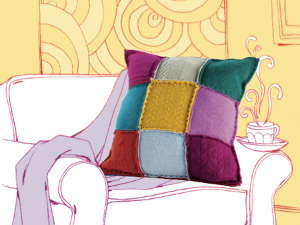 For this project, you’ll need green, dark red/wine (or desired color) and yellow-green yarn. 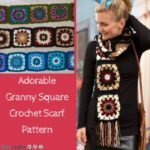 This gorgeous little pattern will tide you over until the spring weather arrives. CraftFoxes offers full instructions to make this knitted flower pattern. Add to your bouquet by creating a Diver Down Flower using a knitting loom. Go ahead – crack open a bottle of wine tonight. Enjoy in our favorite vino and when you’re done, save the bottle and create wine bottles, vases and other decor crafts. 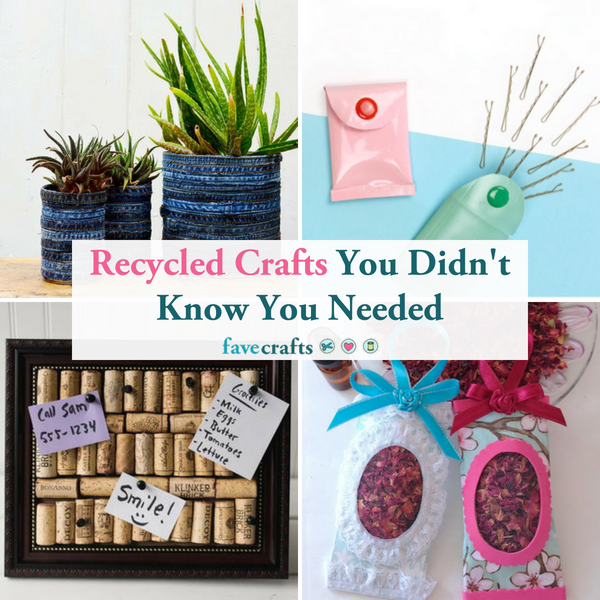 For these crafts, you can not only recycle old glass bottles but also make use of leftover yarn, paint or tissue paper. You can paint the bottles, decoupage them or even wrap them up. You can display them indoors on a table or outside on your porch. 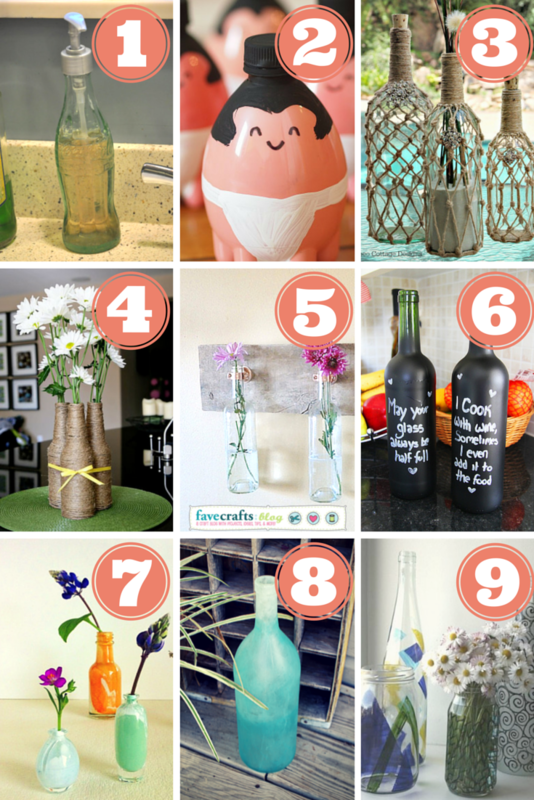 Wine bottle crafts are some over the most versatile projects on Earth. Don’t believe me? 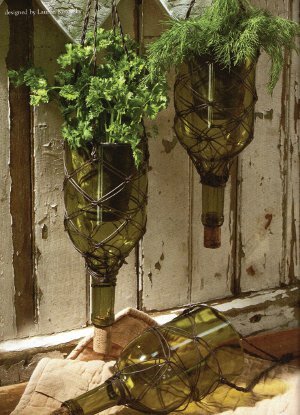 Check out our roundup of 10 Things to Do With Old Wine Bottles and discover creative new ideas. 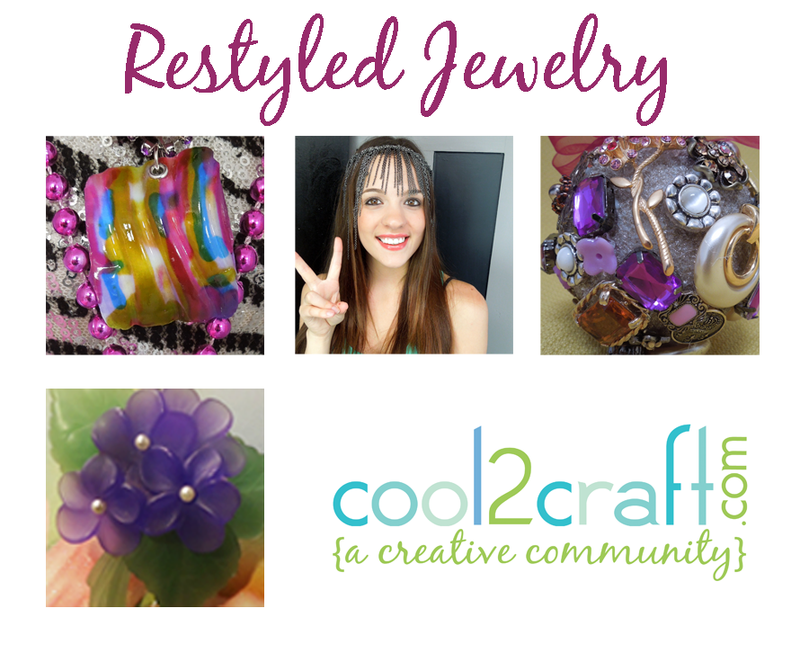 Make a Faux Dichroic Glass Recycled Bottle that will help you stay organized and neat in the new year. If you’re planning an outdoor party, consider creating your own Wine Bottle Candle Shelter to light up the night. Whether you’re planning an evening in with the girls or want your nightly dose of anti-oxidants, a bottle of delicious wine can really set the mood. In 2013, make it a point to recycle your empty bottles and make cool decor crafts for all seasons. 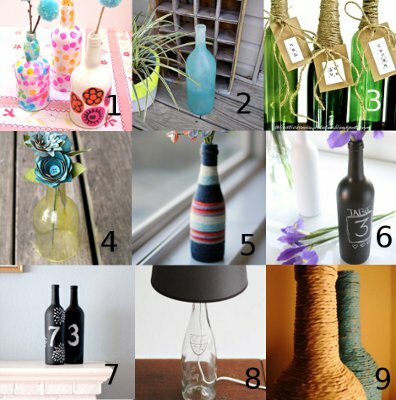 Say goodbye to guilt and “cheers” to fun wine bottle craft ideas in 2013.